Elva Hsiao (Chinese :蕭亞軒; pinyin :Xiāo Yăxuān, born 24 August 1979) is a Taiwanese singer and actress. New Talent Singing Awards Vancouver Audition or NTSA Vancouver for short, is an annual singing contest organized by Fairchild Television in Vancouver, held every July. The winner of the contest will represent the city of Vancouver in the NTSA International Finals, usually held in Hong Kong, organized by TVB. East Asian blepharoplasty, also known as "double eyelid surgery", is a type of cosmetic surgery where the skin around the eye is reshaped (blepharoplasty). The purpose of the procedure is to create an upper eyelid with a crease from an eyelid that is naturally without a crease. Elva Hsiao is the debut album by Taiwanese singer Elva Hsiao, released on 17 November 1999 by Virgin Records Taiwan. Red Rose is the second studio album by Taiwanese singer Elva Hsiao, released on 15 August 2000 by Virgin Records Taiwan. The songs, "Personal Highlight" and "Rose", reached number fifteen and forty-three respectively on Hit FM Annual Top 100 Singles in 2000. Tomorrow is the third studio album by Taiwanese singer Elva Hsiao, released on 21 April 2001 by Virgin Records Taiwan. The songs, "I Love You Lots" and "Tomorrow", reached number twenty–six and forty–nine respectively on Hit FM Annual Top 100 Singles in 2001. Faye Marder Kellerman is an American writer of mystery novels, in particular the "Peter Decker/Rina Lazarus" series as well as three non-series books, The Quality of Mercy, Moon Music and Straight into Darkness. Vanness Wu is a Taiwanese-American actor, entertainer, singer, director, and producer. He is a member of the Taiwanese boyband F4 and the Korean Mandopop duo Kangta & Vanness. Lin Li-hui, better known by her stage name Shu Qi, is a Taiwanese-Hong Kong actress and model. As of 2014, she was among the highest paid actresses in China. Aiko Yanai, known by her stage name Aiko, is a Japanese pop singer and songwriter. Shunza is a Chinese-American singer-songwriter known for her "velvet" voice and love ballads. Unlike most pop idols who perform in front of screaming fans, Shunza's concerts are more intimate and cocktail-style. Over the course of her career, she has collaborated with Taiwanese artists such as Elva Hsiao and Will Pan. Show Lo is a Taiwanese singer, actor and host. He is commonly known by his nickname Xiao Zhu. Lo is recognized for his trademark dance music and comedic talent. He has over 50 million followers on China's micro-blogging platform Weibo as of June 2018. "Carly Phillips" is the pen name which novelist Karen Drogin has used as her by-line for over twenty-three best-selling contemporary romance novels that she has written. According to CarlyPhillips.com, her net-site, Drogin is a former attorney who was unhappy with her practice of law. Kieran Scott is an American author of such chick lit books as The Princess and the Pauper, Megan Meade's Guide to the McGowan Boys, The Virginity Club, Sweet 16, Fake Boyfriend, and the Private series. Books published under Scott's own name include She's So Dead to Us, I Was a Non-Blonde Cheerleader, which was nominated for YALSA's Teens Top Ten, Brunettes Strike Back, A Non-Blonde Cheerleader in Love, and Geek Magnet. Hedkandi is a UK-based record label, events and music brand. Its back catalogue includes both artist albums and dance music compilations. 3 Faced Elva is Taiwanese Mandopop artist Elva Hsiao's ninth Mandarin studio album. It was released on 15 June 2008 by EMI Music Taiwan and her first album since returning to EMI Music Taiwan. It was available for pre-order from 2 June 2008. The discography of English boy band Blue consists of five studio albums, five compilation albums, one remix album, seventeen singles and thirteen music videos. The band originally formed in 2000 and released three studio albums, All Rise (2001), One Love (2002) and Guilty (2003) that all peaked at number one in the United Kingdom alongside releasing sixteen singles, over a four-year period. The group also worked alongside artists such as Stevie Wonder, Elton John and Lil Kim. The band also once tour with Cee Lo Green. Hsiao Huang-chi is a Taiwanese singer, songwriter and former judoka. He represented Taiwan in FESPIC Games in Beijing in 1994, where he won the bronze title and placed seventh at the 1996 Atlanta Paralympics. 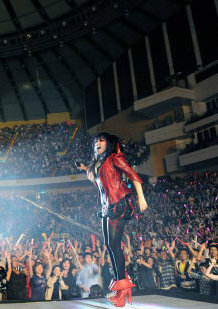 Hsiao gained attention in the Hokkien pop scene after winning the Best Male Vocalist – Taiwanese award at the 19th Golden Melody Awards in 2008. So Elva is the sixth studio album by Taiwanese singer Elva Hsiao, released on 16 May 2003 by Virgin Records Taiwan. Park Chul-min is a South Korean actor. ↑ "Elva Hsiao confesses to double eyelid surgery". Xin MSN Entertainment. 5 May 2010. Retrieved 29 May 2012. Wikimedia Commons has media related to Elva Hsiao .